If you’ve been around this site long enough, you’ll know that we are big fans here of using our no-knead brioche dough to make doughnuts. 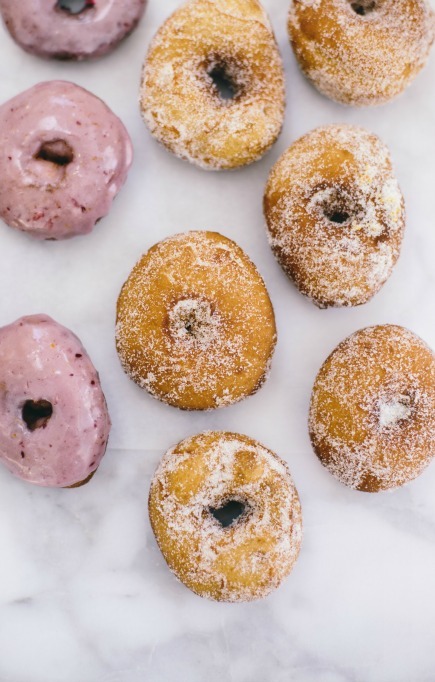 We’ve made jelly-filled doughnuts, mini-doughnuts, espresso-chocolate doughnuts, powdered sugar doughnuts, and even s’mores doughnuts. But I firmly believe that there can’t be too many ways to enjoy one of our favorite treats, and so I bring you yet another recipe for warm, delicious circles of goodness. After reviving our spelt pizza dough a few weeks ago, I decided to try and come up with an enriched version of it; I like the flavor it lends to sweet confections, and it makes whatever I am baking a little more healthy, which is always a good thing. This dough is made with both spelt and all-purpose flour, and fries up light and tasty. Somehow another year has slipped by again. Many of us are winding down our holiday preparations, and we are packing up ornaments, changing our diets, and erasing holiday playlists from our iPods. However, there is one day left to celebrate with good cheer; one door left open to a little decadence and indulgence. This would, of course, be New Years, and we are ready to ring it in. It is that time of year again in Minnesota, when the weather goes from 90°F one day, to 48°F the next. It is bittersweet to lose summer, but we enthusiastically head into baking season. This time of year also brings the apples, glorious apples. This week alone I have made pie, fritters, waffles and these baked doughnuts with all the apple varieties I found at the farmers market (or your favorite orchard). Baked Doughnuts? 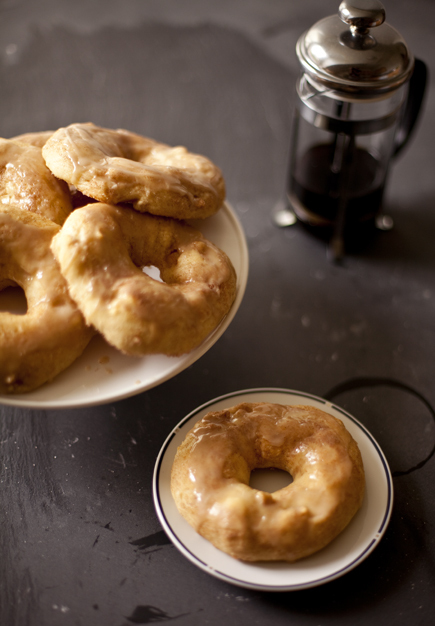 Many of you have requested a doughnut recipe that is not fried. I admit I was hesitant, since I am a doughnut fanatic and was afraid the baked version would be a poor substitute. I am, once again, thrilled to announce YOU WERE RIGHT! 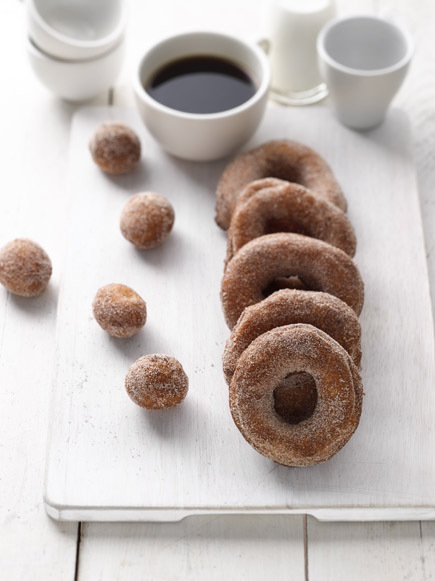 The baked apple doughnuts are tender, sweet and studded with pieces of tart apples. The trick is to coat the dough in lots of cinnamon sugar, then bake them so they are still soft on the inside and have a wonderful sugar crust on the outside. 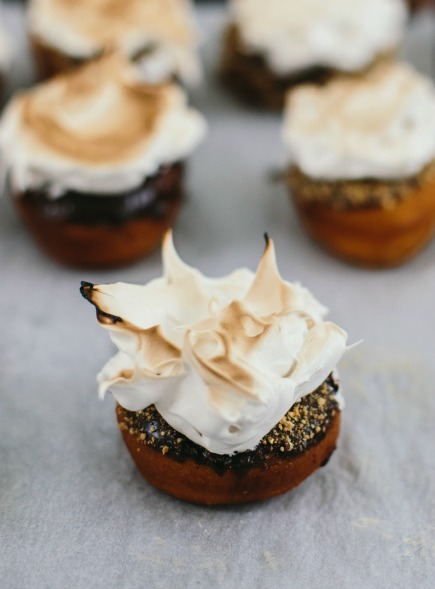 The Maple Glaze gives them an even more decadent feel, even though they are the healthy version of our favorite treat. You may never miss the fried version again, but if you are like me, you’ll make both. 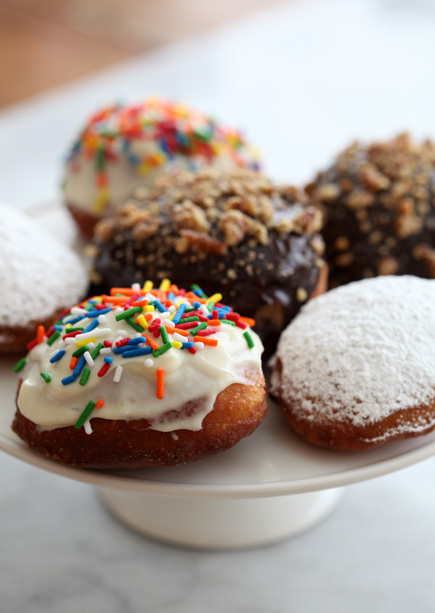 This week is Chanukah and my family revels in the amount of doughnuts (sufganiyot) we can eat. It is tradition during the holiday to eat fried food, lots of it, which is something I easily embrace. We start with lacy potato latkes and end the meal with jelly doughnuts. This year I filled the doughnuts with many types of jam, jelly and preserves, each had a different topping to go with it. Each one became my new favorite. With a bucket of brioche dough from ABin5 and some oil you are ready to make doughnuts that are better than the bakery down the street. We want to thank Willie Geist for featuring Artisan Bread in Five Minutes a Day on this weekends broadcast of the TODAY SHOW. What a thrill!